In large nonstick skillet, cook onion and garlic in oil 5 minutes or until starting to soften, stirring frequently. Stir in beans, lime juice, cumin, chili powder and hot sauce. Cook 5 minutes or until thoroughly heated, stirring occasionally. Stir in spinach and bell pepper; cover and cook 5 minutes or until spinach is wilted and pepper is crisp-tender, stirring once or twice. Set aside. Microwave rice as directed on package. In small bowl, beat eggs, milk and salt. Melt butter in small nonstick skillet over medium heat. Add eggs and cook 2 or 3 minutes or until set but still moist, stirring and folding over occasionally for even cooking. 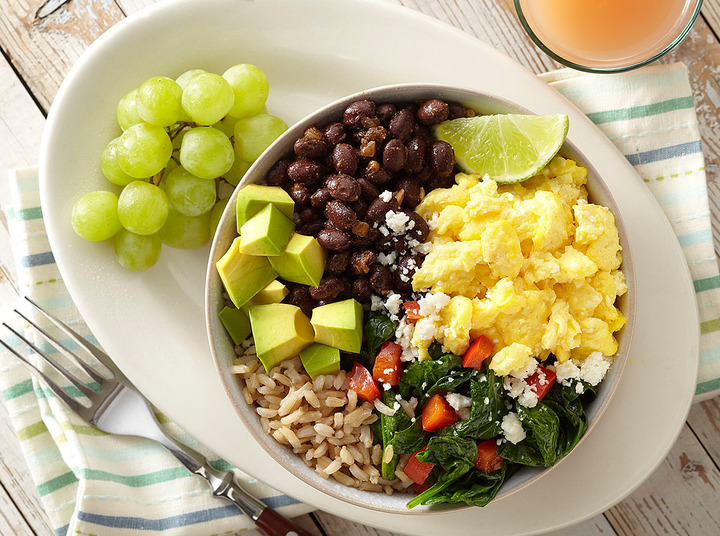 To serve, divide black bean mixture among 4 bowls, spooning into one side. Divide rice evenly among bowl. Top with scrambled eggs.